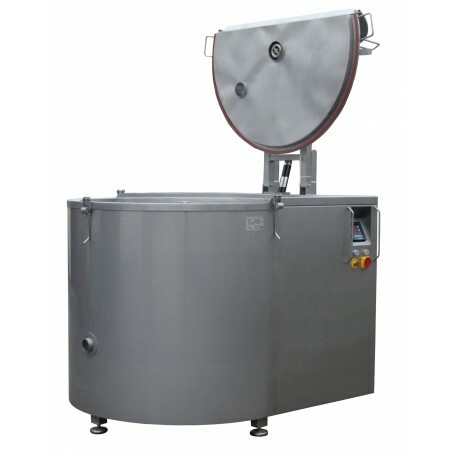 Electric Boiling Pan with capacity of 150 litres, indirect heat. 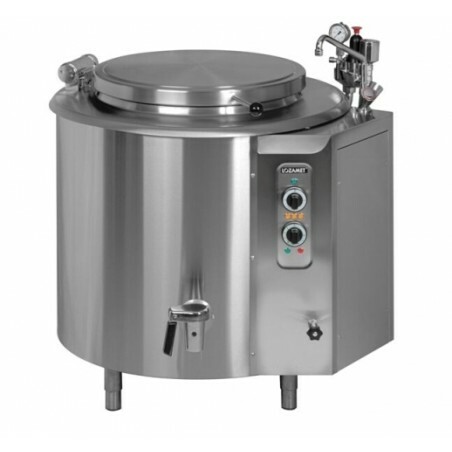 Heat in this boiling pan is created by high pressure steam generated in installed evaporator inside. As a result, steam is heating up the whole volume of the boiler not just a bottom. This technique makes our boiling pans perfect for cooking jams, soups, chutneys or just simply water. Reaching the boiling point - 80-90min. By buying this product you can collect up to 290 loyalty points. Your cart will total 290 points that can be converted into a voucher of £ 58.00. 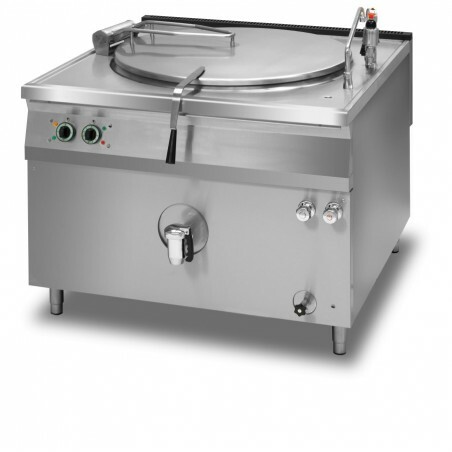 The boiling pan's heating tank consists of a double jacket and is made entirely of acid resistant stainless steel. Content of the heat tank is heated with steam generated in the space, known as the heater, between the jackets. 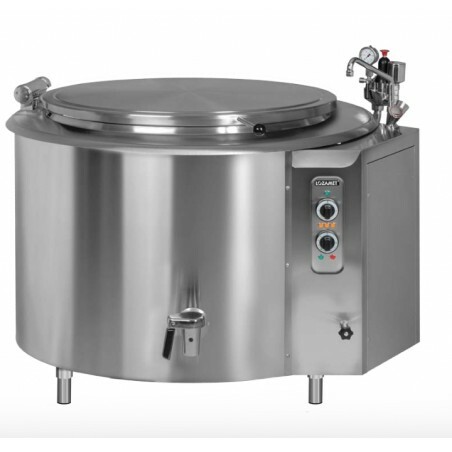 Thanks to the use of modern technology and high quality materials our boiling pans fulfil the high utility and sanitary requirements. 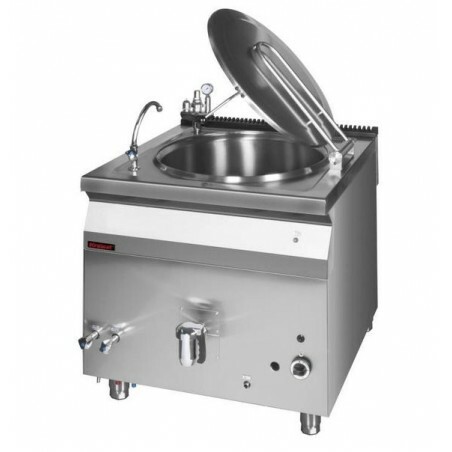 Counterbalanced lid will keep the lid open in any position. 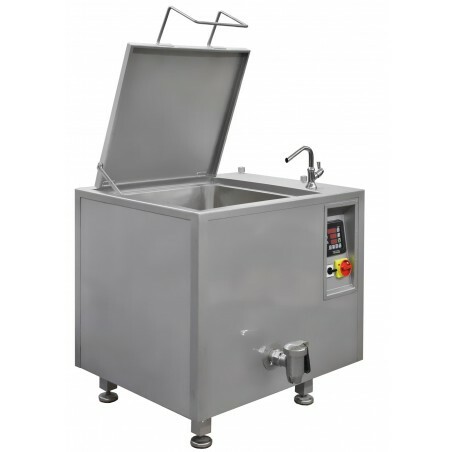 The drain valve allows a convenient way to drain cooked product. 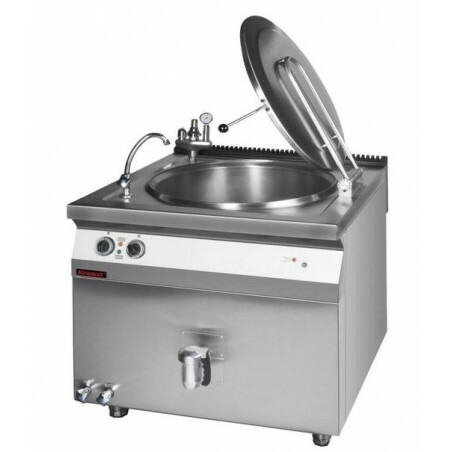 All components that may come into contact with food are made of acid resistant stainless steel of 1.4301 grade.The housing is made of stainless steel of 1.4509 grade. The water used for steam generation is heated by electric heaters placed between the inner bottom and outer bottom of the heat tank. The control system enables adjustment of heating intensity by proper setting of the thermostat and the three stage control of heating power by switching on the relevant heating sections. This allows for economical management of electricity consumption. 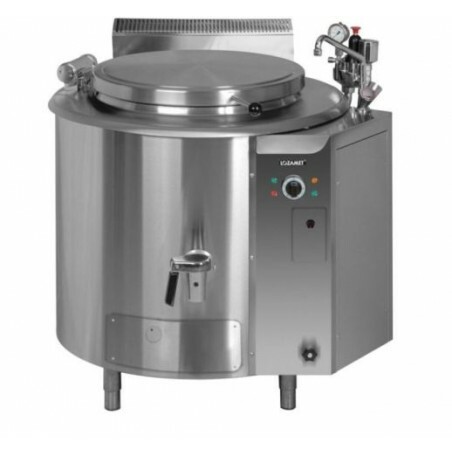 The boiling pan is equipped with a temperature limiter which protects the heaters and the electronic water level control system in the space between the jackets and indicates the need for water replenishment. 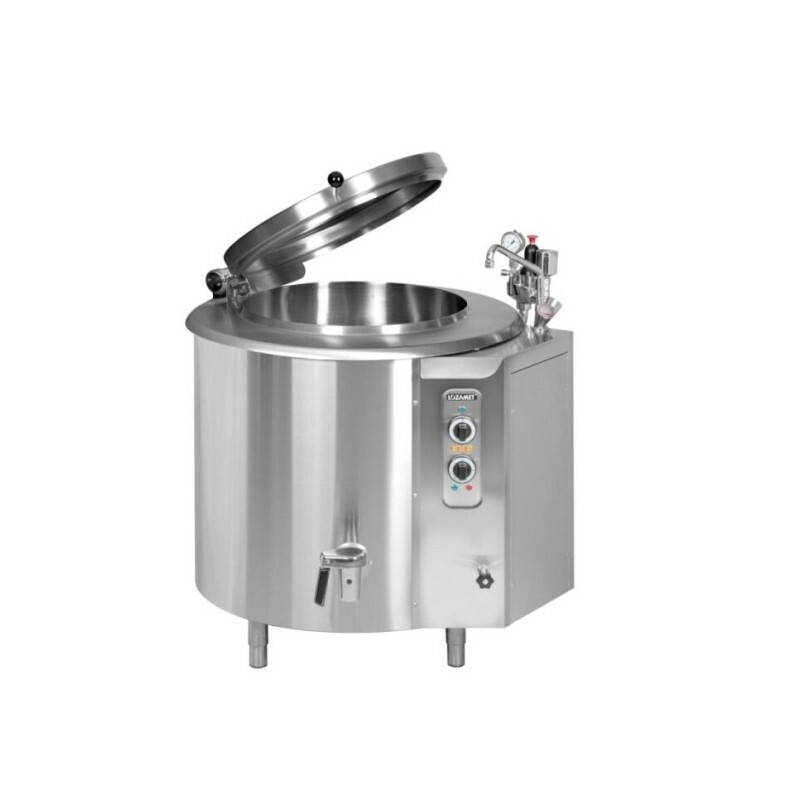 The boiling pan is also equipped with the pressure control to maintain steam pressure at an optimum level. This prevents loss of steam and reduces the frequency of refiling water in the jacket. 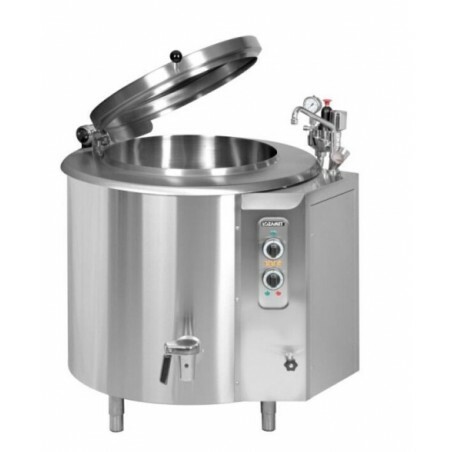 As a standard, the boiling pan is equipped with safety fittings to protect the boiling pan against excessive pressure. Spread the cost with finacing for as little as £27.77p/w + VAT for this product. Call us today to apply. Subject to a credit status.